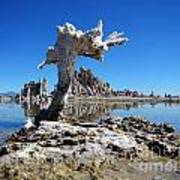 There are no comments for Mono Lake 5709. Click here to post the first comment. Sagebrush covered in salt at Mono Lake. 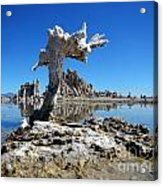 This is a large, shallow saline soda lake in Mono County, California, formed at least 760,000 years ago as a terminal lake in a basin that has no outlet to the ocean. 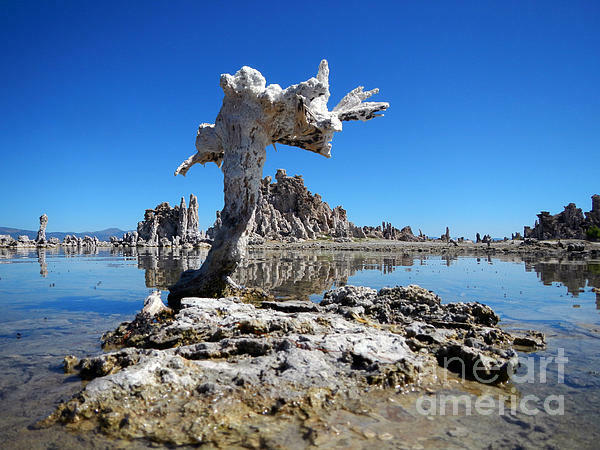 The lack of an outlet causes high levels of salts to accumulate in the lake. The unusual rock formations that grace Mono Lake's shores are known to geologists as tufa (too'-fah). 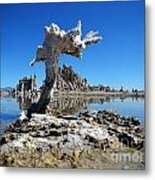 Tufa forms in a variety of ways at Mono Lake, but the most visible and remarkable formations are the towers that grace Mono's shoreline. Surface elevation: 6,378' (1,944 m) Area: 69.5 sq miles (180 km�) Length: 9.321 miles (15 km) Width: 13.05 miles (21 km) Mean depth: 56' (17 m) Islands: Paoha Island, Negit Island.